Who invented the Catapult? The name of the person credited with inventing the Catapult is Dionysius the Elder (c. 432 BC - 367 BC). Dionysius the Elder is not only famous as the Ancient Greek inventor of the Catapult but also as a politician and tyrannical ruler of Syracuse (Sicily). When was the Catapult invented? Dionysius the Elder invented the arrow shooting Catapult c. 400 BCE which was used in the Siege of Motya in Sicily against the Carthaginians. Definition of the Catapult: The Catapult is defined as a large, heavy war engine somewhat resembling a massive crossbow, used by the ancient Greeks and Romans and in the Medieval era as heavy artillery used during sieges for hurling large stones, spears, arrows etc over a great distance. The designs of many Catapults worked by a central lever mounted in counterpoise, similar to a see-saw movement. Fact 1: Who invented the Catapult? The Catapult was invented by Dionysius the Elder in c. 400 BCE during the Ancient Greek (600 BC - 400AD) era of inventions. Fact 2: Who invented the Catapult? The word Catapult derives from the Greek word 'Katapeltes' meaning "to toss or hurl against" (in reference to walls). Fact 3: Who invented the Catapult? Prior to the invention of the Catapult in c. 400 BCE, there were few siege weapons that were available to destroy the heavier and stronger and well defended fortifications and castles that were being built at the time. Fact 4: Who invented the Catapult? Engineers of these ancient times began to design massive siege attack weapons and any machines that were capable of hurling an object were considered to be a type of catapult. Fact 5: Who invented the Catapult? The inventor of the Catapult, Dionysius the Elder, was born on c. 432 BC in Greek colony of Syracuse in Sicily, Italy and died on 367 BC. He is therefore often referred to as Dionysius the Elder of Syracuse. He also took the title of King Dionysius I and became famous as the Greek tyrant of Syracuse. Fact 6: Who invented the Catapult? The early years of Dionysius the Elder were spent in Greek colony of Syracuse in Sicily, Italy where he was raised by his family. Dionysius the Elder did not come from a noble family but was well educated at the great Greek schools of learning in the city of Syracuse. Fact 7: Who invented the Catapult? Following his education his first job was working as a clerk in a public office. The Greek city-states led by Syracuse in Sicily were involved in the long running Sicilian Wars against Carthage for control of the western Mediterranean. Carthage was founded by the great sea-faring civilisation of the Phoenicians. The ambitious Dionysius joined in the fight in 409. Such was his ruthlessness that he distinguished himself fighting in the war, became nominated as a general and was made supreme chief of the Republic about B.C. 405, when he was just twenty-five years of age. Fact 8: Who invented the Catapult? Dionysius of Syracuse consolidated his power by making himself master of numerous other towns in Sicily and violently squashing any revolts against his rule. During his battles to consolidate his power he was instrumental in developing the catapult which would one day be used to destroy great stone city walls and castles. Fact 9: Who invented the Catapult? The invention of the early Catapult began as a weapon called a 'gastraphetes', a precursor of the crossbow that used an elaborate sliding ratchet mechanism. The 'gastraphetes' was an impressive weapon that was more accurate and had a greater range than any existing bows. Fact 10: Who invented the Catapult? Syracusan engineers under the orders of Dionysius I enlarged the gastraphetes until it was too heavy for one man to carry. The giant gastraphetes weapon became known as the 'Katapeltes' or the Catapult. Fact 11: Who invented the Catapult? This first Catapult was mounted on a pedestal base with a winch to draw the weapon's arrows (metal bolts) back with two soldiers operating the levers. The weapon was meticulously balanced on a swivel joint so that it could be easily aimed in any direction. Fact 12: Who invented the Catapult? The first Catapult was used at the Siege of Motya, the main base of the Carthaginians on the far west of Sicily. The Catapult was used in conjunction with battering rams and six-storey mobile towers and Dionysius I was able to take the city of Motya by storm. Fact 13: Who invented the Catapult? Dionysius the Elder died on 367 BC leaving a legacy of vicious reputation and the invention of the catapult. The invention of the Catapult, together with the siege technique and other weapons used at the Siege of Motya became the standard weapons and strategies used in the most successful ancient sieges. Fact 14: Who invented the Catapult? The Romans were quick to copy the new weapon which remained a mainstay of siege warfare into the Middle Ages. Catapults were used to launch various missiles including arrows (metal bolts), massive darts with iron points and sharp wooden poles. The armies who used the catapult in siege warfare also used fire, disease ridden parts, dung and rotting carcasses as missiles. Fact 15: Who invented the Catapult? The names of different types of catapults included the Ballista, the Trebuchet, the Mangonel, the Springald and the Onager which were all developed by early civilisations. Fact 16: Who invented the Catapult? The Ballista catapult was similar in design to a Giant Crossbow and worked by using tension. The Ballista was able to project a stone weighing from 50 to 300 pounds across hundreds of yards. 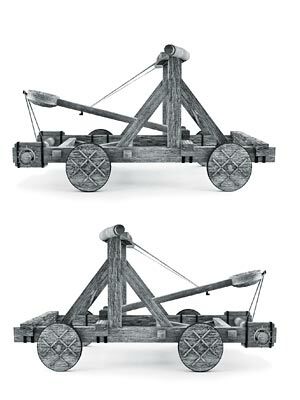 The Springald and the Onager were smaller versions of the Ballista. Fact 17: Who invented the Catapult? The Mangonel fired heavy projectiles from a bowl-shaped bucket at the end of its arm. The Mangonel was not as accurate as the Ballista but it was able to throw missiles further than another type of catapult called the Trebuchet. Fact 18: Who invented the Catapult? The massive Trebuchet consisted of a lever and a sling that could throw up to 2000 stones weighing 200 pounds with a range of up to about 300 yards in a day, smashing walls of cities and castles.